"St. Stephen’s Church (the Peppercanister ), Dublin, have recently installed a a semi-permanent Roll-a-Ramp complete with handrail to provide assisted disabled access into the church. 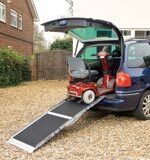 The ramp which caters for a rise of approx 4ft is easily removed for storage or use elsewhere if required. 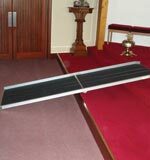 Access Needs were able to demonstrate that Roll-a-Ramp was the best semi-permanent solution to a very difficult access problem at the church". 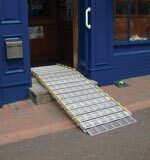 "St Columb's Cathedral, Londonderry , is using a Roll-a-Ramp to facilitate disabled access.The ramp has proved invaluable for access to stepped areas by both parishioners and visitors. This is a further access improvement in the cathedral`s plan to comply with DDA requirements". 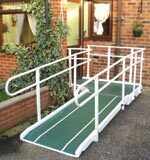 "The ramps have enabled us to secure more business.Having a Grade Two listed building made the new Disability Act 2004 hard to comply with but having Roll-a-Ramp has solved this problem". "From no solution to complete solution. Stable, sensible width, light and easily portable, ideal for storage, simple adjustment. Good accessories." 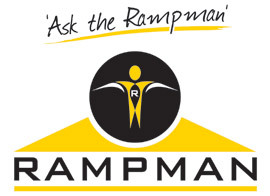 "Just wanted to let you know what a difference your Rollaramps have made to our Front of House operation. Being a grade one listed building we were unable to modify the entrance to our Pall Mall premises in order to ease access for wheel chair users. 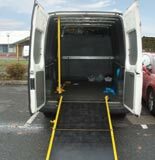 Your portable ramps have provided the solution and are in daily use. Their build quality and load bearing capabilities also allows us to access heavy loads from grand pianos to cumbersome audio visual equipment and furniture with ease and simplicity. Thanks from all of the Front of House team." 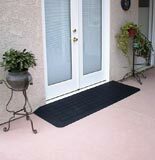 "I am overwhelmingly impressed with the reliability and stability of the product. Being so steady but at the same time adaptable and lightweight, it is extremely user friendly. As it fits easily into the car boot, it would also be a useful device to take on daytrips to locations such as parks and beaches"